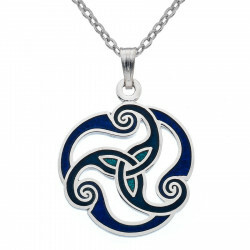 An elegant and beautiful Triskele pendant, made from plated copper and blue vitreous glass enamel. This elegant and beautiful Triskele pendant is made from plated copper and blue vitreous glass enamel. This piece of jewellery is designed in Cornwall, UK, representing a tale of forward motion to reach understanding. It would make an ideal gift. Supplied with a chain, in a little gift box. Celtic Lands gets its inspiration through celtic art to create its jewellery and gifts. 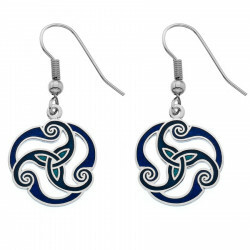 Its creations are timeless and have the symbols of the celtic culture. For over 30 years, the family company creates and sells unique jewellery in the region of Cornwall in England. Each piece is carefully selected by silvermiths to insure quality and originality. Celtic copper drop earrings, with a blue vitreous glass enamel triskele. Vitreous glass enamel and Rhodium plated copper.